The Defense Department announced Tuesday that it would begin honoring the human rights protections of the Geneva Convention with respect to detainees it is holding in Guantanamo Bay and elsewhere around the world. In a memo released by the Pentagon this morning, Deputy Defense Secretary Gordon England, citing the Supreme Court’s decision, ordered all Pentagon personnel to “adhere to these standards” and to “promptly review” all policies and practices “to ensure that they comply with the standards” of the Geneva Convention’s Common Article 3. Since 2001, the administration has argued that the Geneva Conventions would be respected as a matter of policy but that they did not apply by law. The Supreme Court, in a 5-3 decision, rejected that view. Nothing in the generally accepted libertarian view prevents responding to force initiated against you. So going after Osama bin Laden is one thing, and not too many would disagree that it was the right thing to do. It’s everything else that’s come along with that in the last five years that’s been a problem. I’ll grant Tony Snow one concession: Prosecuting a war on terror is a complex task, especially for a country founded on libertarian principles — even if many of those principles lie abandoned just outside the Beltway. Hell, you know if our government “sevrants” could get away with it they would do this to us. Sol — be fair. It’s not that the people *plan* to do it… it is merely that human beings are genetically bred *TO* do such things when in positions of power without restraint or supervision. Blame the torturer, yes. But blame also the men who knowingly allow the circumstae to exist. This study was done in ’71. Read the article linked above. Even if you already know — it bears repeating. 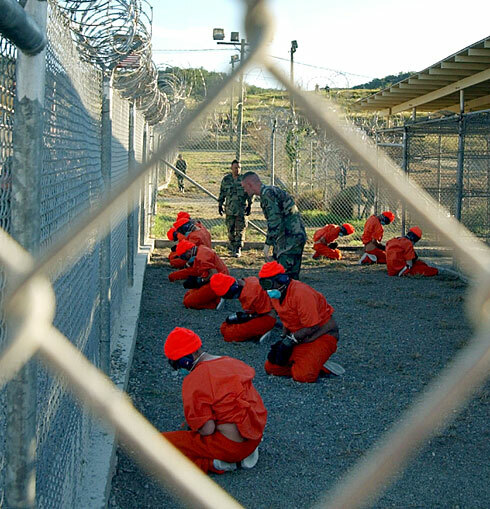 Gitmo & Abu-Ghraib… are evil, not because we are gung-ho, but because all restraints are lifted. It may be unlibertarian of me to say, but thank God for the Geneva Convention. I think it is good always good to have a check on government abuse of power, and the Geneva Convention may be an institution of “world government” in a sense, but the Geneva Convention protects the right to due process better than our own Federal Government. Really? These people are trying to gain absolute power and if and when they get it I’m sure they will put people like us into those fashionable orange jumpsuits and give us an all expense paid vacation to Camp Gitmo for speaking out. But look on the bright side: you’ll get one of those real cool orange beanie caps. Sol: Please don’t take my statements out of context, ‘k? Reading the whole of my post it is quite clear that by “these people” I was referring to the ones committing the physical acts: The prison guards themselves. Do you seriously expect me — or anyone else — to believe that military prison guards are the highest order of authority in the world, to which all usurpers of society seek to elevate themselves? For you Federale types reading that previous post, most likely given current electronic information standards: I AM NOT ADVOCATING A CRIMINAL ACT. I AM ADVOCATING THE PROSECUTION AND LEGAL PUNISHMENT OF CRIMINAL ACTIONS IN A COURT OF LAW. How is it possible that you worry more about rights of fasicsts who would kill you the first chance they have as opposed to your own government that is killing those who would kill you? Your are so naive. I escaped from Communism (pretty much the same system as Osama is trying to impose) to America and never expected so many naive liberals here that would endanger their own lives in the pursuit of idealistic idiotism i.e., Bush is more dangerous than Osama. Your are lucky that there is a first amandment but you don’t know it. GG — That 1st Amendment and everything that MAKES America, America, exist solely because of people who believed in the general directions in which we believed. This would cost less than our operations in Iraq, and as our presence *IN* Iraq is hurting American safety — PERIOD! — it would be vastly more effective. GG — Furthermore; Communism and Fascism are equally enemies of Freedom. Osama is a real enemy. I personally would far rather he and Al Qaeda et al be fought, rather than given fuel for their fires as is currently being done. GG – If anyone fully appreciates the First Amendment, it’s us libertarians. Oh, so that’s what I am. A naive liberal. Thanks for setting me straight on that. Damn, I thought I was posting in one of the Green Party’s blogs. Sorry, wrong blog. GG – the innocence or guilt of any the Guantanamo Bay prisoners has not been proven, so how can you level such accusations, other than blind trust that the government will always do the right thing, a rather Communist sentiment if you think about it. Anyone who thinks Bush is worse than Osama is an idiot, but that is not the issue at hand. What is at hand is the Bush administration expecting to not be bound, on a technicality, to the Constitutional limits on indefinite detention without a trial. Giving the government absolute power during wartime or anytime is incredibly Communist. The terrorists won’t kill me by getting a day in court. Those who are found innocent will hopefully not be terrorists after all – the government does make mistakes. IMO, “setting dogs” on prisoners doesn’t mean “we let the dogs rip off their nutsacks”; it means we used dogs to scare the bejezus out of them. If the latter were the case, I’d be all against that. But you gotta admit… we don’t chop their heads off. They do. Not defending the current erstwhile dictatorship, mind you. And I’m not looking forward to the inevitable would-be Democrat-led dictatorship, either. So, does this mean our soldiers have to read the Miranda warning to potential captives, or it gets tossed out in court? And do we provide public defenders to these guys? Keith: Considering the Miranda warning is no longer required by law? Nope. This shouldn’t be a standard on *holding* prisoners in a war-time environment… such as Iraq and Afghanistan. But then, “probable cause” clauses exist for a reason. It’s legally justified to hold a prisoner on the basis of “He was pulling the trigger on a gun pointed at me.” — and that alone would be enough to convict if he were made a prisoner. But we’re not talking about COMBATANT prisoners — regardless of Bush’s definitions of combatants — we’re talking about, in many cases, American citizens, and people taken from their homes or places of work. Let the truth set them free — or fry their brains on a AC/DC joy-ride, as necessary. *PROVEN* truth. Providing public defenders to people who aren’t U.S. citizens, seems to me like we’re giving them too much. Hell, they aren’t even members of a standing army. American citizens, however, do deserve Constitutional rights. No argument there. Keith — fortunately/unfortunately the Constitution doesn’t implicate that its rights extend only to citizens of the nation. That’s a whole different ball of wax, granted. But — what does it say about a nation that all it takes to have no rights whatsoever (up to and including slavery) is to simply not be a citizen? Either these things apply universally or they don’t apply at all. Now — I *FREELY* grant that this is a high standard. Yet I also state that it is a *NECESSARY* standard. Think of it in another light; oughtn’t we know that we are punishing the *REAL* terrorists rather than people we *THINK* are terrorists? Going out and stopping the bad things from happening — that’s fine; no court precedents needed. But punishment of captives? Different story. “It is better than one thousand guilty men go free than one innocent man be punished.” — Who said that?